All of us face this problem every now and then. Say you want to copy some text from a website such as a flight schedule or a quote and paste it into Evernote, email or a Word document. Most often the result is formatted, HTML text when all you want is to copy plain text. This is really annoying. But if you’re using either Chrome or Firefox, there are a few easy to use extensions you can use to solve this problem. 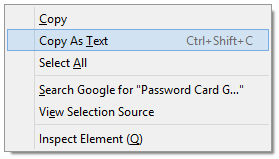 If you are using Chrome, you just need to install Copy Plain Text extension for Chrome. Now select any text you want to copy, right click and choose “Copy … Unformatted” menu as shown below. One drawback, reciprocated by many reviewers of this extension, is that it also loses the New Line character when it copies the text. Nevertheless, it is a useful extension to have if you are using Chrome. If you are using Firefox, you have a number of options like Copy Plain Text, Copy Plain Text – Jetpack, Copy As Plain Text and Copy Pure Text. All of these, more or less, offer similar functionality as expected i.e. copy plain text. Copy Pure Text stands out for me as it also preserves the New Line characters.